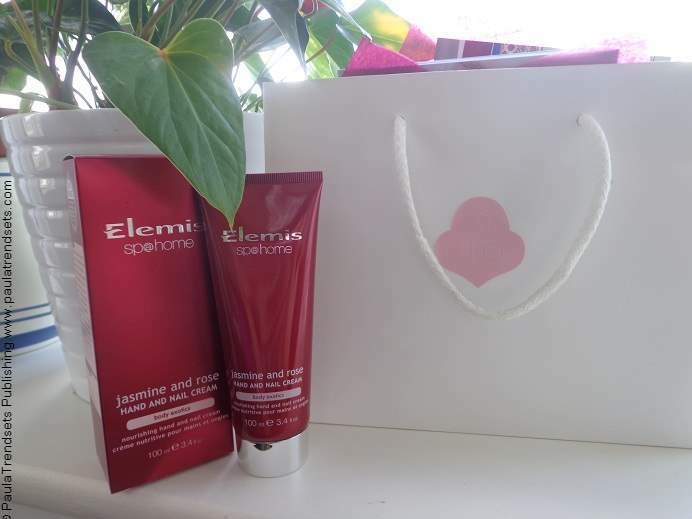 I found this Elemis Jasmine and Rose Hand and Nail Cream in my Numerati goody bag last summer and I didn’t use it until the cold weather kicked in this week; my hands always feel sore and dry in the cold brittish weather. Of course it’s not yet as bad as when we are into winter, but I had started to feel the dryness when it occured to me that I had this full-size tube of Elemis hand cream somewhere near my boudoir. So, instead of reaching for the hand cream I used last winter, I longed to open the dark red box, take off the tube lid, remove the protective seal and feel what I expected to be a jasmine and rose fragrance. The cream’s fragrance is indeed very jasmine-y, very reminiscent of flower water. I didn’t really feel a note of rose in it (my mum thinks otherwise), but it certainly smells amazing and I liked how the cream is light and gets immediately absorbed. Unlike many nourishing hand creams, this one does not have a heavy texture and it does not feel greasy at all. In the product description, I see that the hand cream, part of Elemis’ sp@home body exotics cosmetics line, contains Abyssinian and argan oils and aromatic milks of jasmine and white lotus. After the first application, I was surprised to find out that I as I woke up next morning my hands still smelled like jasmine. So far, the difference has been huge compared to my previous hand cream and I will continue to use it not only for dry hands, but also for nail strengthening. Have you tried this hand cream? Or, do you have a favorite one you would like to recommend and why? Feel free to leave your comment.